On the borderline between Austria and Germany, 1250m above sealevel. Difficulty is 3.5, but Terrain is 4. Not so easy. 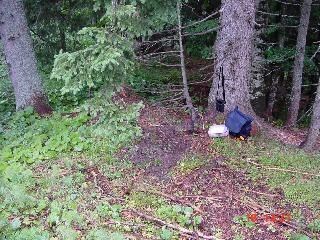 This cache is (nearly) buried on the borderline between Austria and Germany, it is 12m away from it on german territory and is the the first cache in bavaria. Its lying in an altitude of about 1250m and you have to be in a quite good condition as the terrain is rough. The stash is a white tupper-ware box. Drive of the highway A7 at exit "Oy-Mittenberg", head south to the village of "Jungholz". Start your hunt at the parking lot at N047°33,791/E010°26,107. 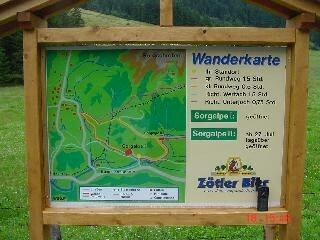 There you will find a sign (see picture), from this sign it is about 1005m to the cache. You have to decide whether to take the right or left way, both ways will lead to the stash, but one way is easier...your GPS will suggest a direction, this is the easier one. Your GPS only shows you the horizonal distance to a point, not the vertical! Do not underestimate the hills. You will have to climb about 250m from parking lot to the stash. It is very dangerous in the mountains to simply walk after the GPS...you will get stuck in some canyons or trees! The trails are steep, watch out and do some breaks to relax. You will need about 2-3h for up- and downhill, better calculate some extra time. Watch out for sunset (some GPS can tell this), if it gets dark, you may encounter problems finding the way back. It is no bad idea to take some (washing-) water and a small first-aid-kit with you. Place of cacheHere the cache is buried. Sign at parking lotThe sign you find at the parking lot.